On Tuesday, all three county commissioners visited the Sabina Senior Citizens at the COVE located off South College Street in Sabina. The seniors group has meals on Tuesdays and Thursdays, usually at the COVE. 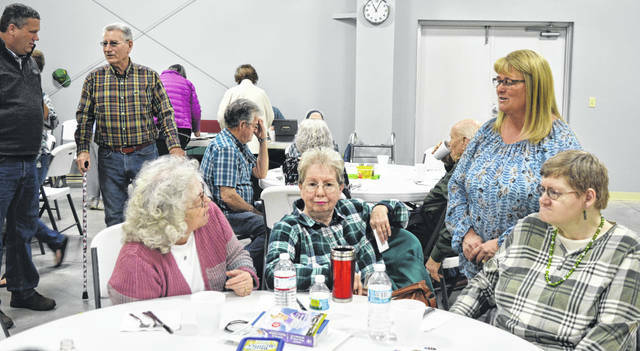 Attendance stood at 56 Tuesday with a luncheon from Shoelaces Catering of New Vienna. On Wednesday, Clinton County commissioners hold the first public hearing on whether to increase the local sales tax rate. From left are Commissioner Kerry Steed and Commissioners President Brenda Woods. WILMINGTON — County commissioners on Wednesday began formal discussions on whether to increase the local sales tax rate after three budgets of drawing money from county carryover dollars in order to balance revenue with expenses. At the end of September 2016, the county commissioners let an additional 0.5 percent local sales tax roll off the books. The commissioners’ plan at the time was to pull from the then almost $6 million of carryover the county had built up. A carryover is the forwarding of a balance of funds from a current budget year into the next budget year. A carryover is recommended so that there are enough cash reserves to pay costs early in a new year and for possible emergency use as well. The county’s carryover has been spent down during the past three annual budget appropriations when there were revenue shortfalls, respectively, of about $1.9 million, $1.5 million, and $1.9 million. The last full calendar year of the additional 0.5 percent local sales tax was 2015, generating about $2.8 million that year. No one from the public attended Wednesday’s first public hearing regarding a possible increase in the county sales tax. A second public hearing will be held 10 a.m. Monday, April 1 at the county commissioners office in the courthouse. Clinton County Commissioners President Brenda K. Woods said after Wednesday’s discussion that, for her part, she does not anticipate action will be taken at the end of the second public hearing. She said she is “not a dead-set ‘yes’ or ‘no’ at this point,” and will be taking into consideration any feedback that may be forthcoming from the public. One thing all three commissioners indicated Wednesday that they do not favor is using funds from the hospital sale to pay for day-to-day operations. Commissioner Mike McCarty said that a consistent message from the public has been to not use proceeds from the sale of formerly county-owned Clinton Memorial Hospital to pay for day-to-day expenses. The additional 0.5 percent local sales tax went into effect in fall 2006 as a temporary means to generate revenue for courthouse renovations, said Steed. Not long after, however, the Great Recession struck and DHL pulled out and the county’s financial situation weakened and the renovations were delayed in order to use much of the sales tax funds to sustain county services, he added. The five-year tax was extended for another five-year period in fall 2011. Proceeds from the hospital sale were used for the postponed courthouse renovations, and the carryover grew to a higher level than is generally recommended. Accordingly, commissioners did not renew the 0.5 percent local sales tax in 2016, and have relied on carryover dollars since then to annually balance appropriated funds with expenditures. Because non-residents pay a good portion of the local sales tax, returning to a higher local sales tax rate is the best option for local taxpayers, Steed believes. Woods said she thinks as the county continues to grow, “we’re going to see that we’re going to need to add services, or add possibly a different way of doing some of the things that we do because of the county growing.” She emphasized that the county’s expected growth is a good thing. Currently, the local sales tax rate is 1 percent. If commissioners approve an additional local sales tax, it does not have to be at the previous additional rate of 0.5 percent. It can also be a 0.25 percent increase. The state’s sales tax rate is 5.75 percent. Presently, then, the total sales tax rate in Clinton County adds up to 6.75 percent. Of Ohio’s 88 counties, 53 of them have a total rate of 7.25 percent. Of Clinton County’s neighboring counties, Fayette, Highland and Brown have 7.25 percent total rates; Warren County has a 7.0 percent total rate; and Greene and Clermont Counties match Clinton’s current total rate of 6.75 percent. By law, Ohio’s counties may only enact sales tax rate changes effective at the start of any calendar quarter.